Written by Ricardo Castro-Salazar, Acting Vice President for International Development, the comprehensive report details the strides the College has made in multiple areas: infusing global knowledge into the curriculum, creating a language institute, developing community and global engagement, developing a study abroad program, identifying opportunities for workforce development in the international arena, providing international and cultural development for employees, and expanding international student outreach, recruitment and services. The importance of these endeavors to the success of all our students cannot be overstated. As Ricardo writes, it is necessary “to educate our community for interdependence, global citizenship skills, and to bring the world to our students, a world driven by a global economy and challenges that transcend national borders.” Bringing the world to Pima is an ambitious undertaking that will benefit our students, city and region academically, culturally and economically. This entry was posted in Uncategorized and tagged global education, international development, International Education, internationalization, veterans on June 9, 2016 by pimachancellor. 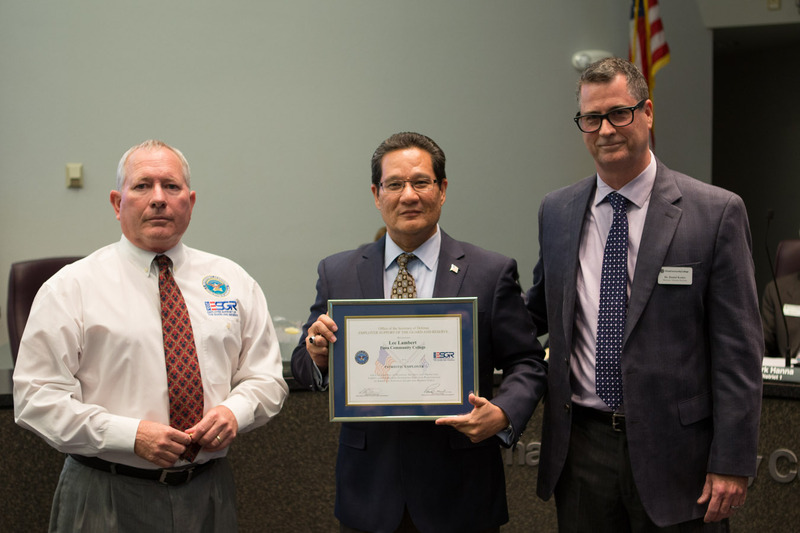 At the May 13 Governing Board meeting, I was recognized by Employer Support of the Guard and Reserve (ESGR) for service to the College’s student-veterans. It is a great honor, and I thank ESGR’s Bruce Hamilton, but the reality is that I was accepting the award in the name of our employees in the office of Veterans and Military Affiliated Services. Each day, they do phenomenal work under the leadership of Director Dr. Daniel Kester. I also want to thank the faculty, staff and administrators who went above and beyond in our successful effort to regain the fullest confidence of the U.S. Department of Veterans Affairs. For 2014-15, PCC has a total enrolled veteran population of more than 2,700 students, including 1,190 using Veteran Educational Benefits. Our staff in Veterans Services and on our campuses assists Veterans Benefit Recipients keep up to date with Veterans Administration requirements. We work closely with student-veterans groups, and last year expanded our Veterans Center. I also should note that our Davis-Monthan Air Force Base Education Center offers quality instruction and services, and that the College currently is training active-duty Air Force personnel to become paramedics. As veterans ourselves, Dr. Kester and I, along with the rest of the College, understand the importance of helping those who served make the transition to productive lives as civilians. It is my hope that we transform our veterans’ office into a Center of Excellence at the College. Veterans and active-duty military keep us free and secure, and we owe them our very best. This entry was posted in Uncategorized and tagged Davis-Monthan Air Force Base, ESGR, student-veterans, veterans on May 14, 2015 by pimachancellor. In a windowless room in our Admissions office, Pima Community College employees are doing important work pertaining to national security. These specialists in veterans’ benefit issues are examining the course records of Veterans Benefit Recipients (VBRs) from PCC. After protecting our freedoms by serving in the military, these veterans know that upon returning to civilian life, they will be able to take advantage of the education and training opportunities afforded them through the Post-9/11 GI Bill. PCC is the bridge to those opportunities. Unfortunately, the College has not performed its duties adequately. U.S. Department of Veterans Affairs auditors earlier this year found that in a significant number of cases, PCC failed to accurately and promptly report to the VA information on changes in enrollment, applicability of credits to a student’s program of study, and out-of-state tuition and fees for VBRs. As a result, the Arizona Veterans Approving Agency has taken away our ability to certify the enrollment of new-to-PCC VBRs for 60 days, and has directed us to improve our record-keeping and other services in order to properly support our student-veterans. We are doing our utmost to make things right, and earlier this week I had the privilege of spending time with PCC specialists who are diligently checking the records. One of the Student Services Specialists/Veterans Certifying Officials succinctly outlined to me the task before her and her colleagues. Working from a checklist derived from a Veterans Administration handbook, the specialists have for the past two weeks begun examining the files of each of the approximately 1,700 VBRs at PCC. They are attempting to verify a wide range of information, including whether courses apply to a student’s program of study, whether withdrawals from classes are accompanied by last dates of attendance, and that proof of previous education exists. Many of the files are correct and can be verified quickly. But many have inaccuracies, and as each veteran’s file is unique and complex, it may take hours to gather correct information. Many veterans have attended PCC for years, meaning the specialists face the daunting task of verifying the accuracy of more than 11,000 semesters of attendance. In some cases, accurately reporting information to the VA will result in the agency contacting some student-veterans. “We are doing the best we possibly can,” the specialist said. After seeing the professionalism and dedication of the 20 employees assisting in the effort – including working nights and weekends — I am confident their labors, and that of Assistant Registrar for Veterans and Graduation Gary Parker and Executive Director of Financial Aid Terra Benson, will bring us up to federal and state standards. The College must do more, however. It needs to create an institution-wide system that makes it impossible for us to veer off course again. Effective administration of veterans’ benefits is the least we can do for those who have sacrificed for all of us. This entry was posted in Uncategorized and tagged U.S. Department of Veterans Affairs, verification, veterans on April 18, 2014 by pimachancellor. The College is enriched by the experiences and perspectives that student-veterans and the approximately 1,600 Veterans Benefits Recipients bring to our campuses each semester. PCC and other higher education institutions are the perfect bridge for veterans as they move from structured military life to a civilian world that is full of choices. As chancellor, an Army veteran, and the son of an Army veteran, I have committed PCC to do right by these brave men and women. An improvement effort is underway, but we have a lot more work to do. Earlier today, I had the privilege of attending the rededication of the expanded and improved Veterans Center at our Downtown Campus. The College worked with student-veterans to redesign the center, located off an attractive campus courtyard. The new center replaces a previous center that was deemed too small and not fully in keeping with the needs of our student-veterans. The Veterans Center is an example of PCC at its best, as is our recent hiring of three Veterans Services Specialists, as well as assigning oversight of Veterans Education Benefits to an Assistant Registrar who is a former student and a retired chief master sergeant with 28 years of service in the Air Force. Also, we have provided in-depth training to Student Services staff so that they can serve as points of contact on the campus, and counsel students on benefit certification. We are offering Veterans Benefit Recipient orientations and the Veterans Services Specialists will spend two days a week on campuses, serving and supporting our Veterans Benefit Recipients as they achieve their academic goals. In summary, the compliance survey found that in a significant number of cases, PCC failed to accurately and promptly report to the VA information on changes in enrollment, applicability of credits to a student’s program of study, and out of state tuition and fees for veterans benefit recipients. Additionally, according to the letter, similar discrepancies were found in 2013, and the College did not follow a plan from March 2013 designed to fix the problems. The College’s veterans department was in transition at the time. But the reality is we dropped the ball. We will have a new plan for improvement ready very soon. All actions in the plan will be completed. The plan will ensure that we fully comply with all federal laws and regulations and state policies. Fixing real problems and delivering tangible benefits doesn’t happen quickly, and institutional change is an ongoing process. However, by meeting problems head-on, PCC can fulfill its commitment to becoming a student-centered learning organization that delivers the best support to our student-veterans and Veteran Benefit Recipients. 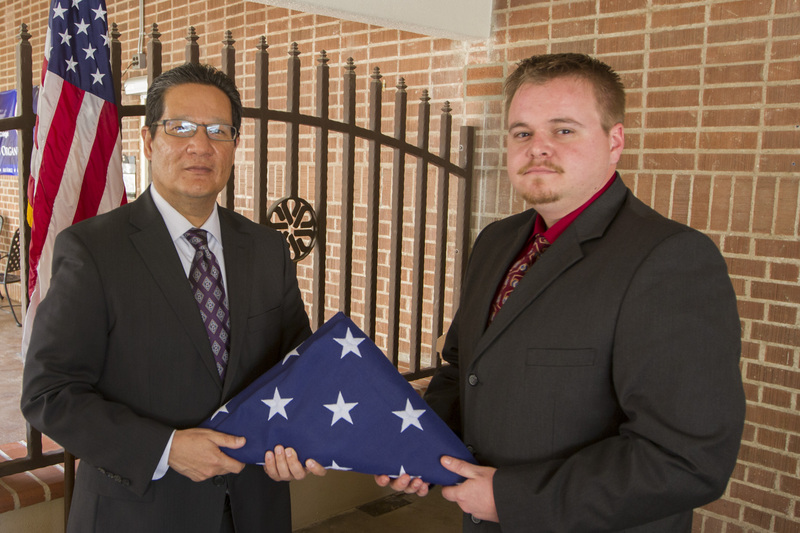 Helping pay society’s debt to veterans is an endeavor that the College is honored to undertake. This entry was posted in Uncategorized and tagged benefits, Pima Community College, U.S. Army, U.S. Department of Veterans Affairs, veterans on March 14, 2014 by pimachancellor. My first 100 days as chancellor of Pima Community College have provided me a valuable opportunity to listen to many of you from this magnificent, diverse community. Thank you for welcoming me to Tucson, my new home. I have met with more than 1,000 members of our community who have expressed both deep concern and anticipated hope that Pima can and will continue to help Southern Arizona residents achieve their education and professional goals. From both within and outside of Pima, I’ve heard countless times that the college is a vital lifeline for training our workforce and for propelling this region into one that is economically vibrant. In April 2013, the Higher Learning Commission placed Pima on probation, primarily due to deficiencies in administration and governance. The commission directed Pima to conduct a top-to-bottom review of its operations and provide evidence of compliance with the accreditation standards set. Getting off probation is Pima’s number one priority. More than 300 staff, faculty, students and community members are working very hard to make the needed improvements. We must learn from the mistakes of other institutions, such as City College of San Francisco, which is facing closure due to loss of accreditation. I want to assure you — the taxpayers of Pima County — that we are resolving the shortcomings identified by the HLC. Last week, Pima College took an important step to ensure compliance with HLC standards when we hired Zelema Harris to be our new interim executive vice chancellor for institutional effectiveness. Harris has more than 30 years’ experience at community colleges, including three months at PCC as interim chancellor earlier this year. Harris has a deep understanding of the accreditation process. In her short tenure as interim chancellor, she won the respect of the community and her colleagues at PCC for her forthright commitment. She will be an invaluable adviser, liaison and administrator as we emerge from probation. Recently, problems at Pima’s Veterans’ Center and Nursing Program surfaced and made headlines. We are employing a new approach to investigate serious allegations that brings in an external investigator to obtain the most accurate, objective information possible. Our strategy is to listen, conduct a fair investigation and, when necessary, respond quickly and decisively. Let us not forget that day-to-day, Pima serves nearly 30,000 students. In May 2013, a school record of 3,726 graduates earned more than 5,000 credentials, helping Pima rank 21st among the more than 1,100 community colleges in the U.S. in the production of associate degrees. Many of our students are of modest means and are able to attend because the college has succeeded in keeping education affordable. Our tuition of $65.50 per credit hour is the third-lowest of Arizona’s 10 community colleges. Pima, like the vast majority of the U.S. community colleges, is proud of its open admissions policy. We are committed to taking each student from where he or she is to where he or she wants to go. We believe that if you invest in education, you invest in shared prosperity. We are committed to developmental and workforce education. We are working to make it easier for our students to transfer to a four-year college or university. We are improving occupational programs, such as automotive technology, which will be supported by better equipment, tools, instructional space and a closer connection to the industry. And we are very proud of Pima’s top-flight programs in adult basic education, family literacy and high school equivalency test preparation. The heart of our institution is our students. Serving them is why we exist, and our faculty and staff are dedicated to helping them succeed. One of our community partners expressed that Southern Arizona needs Pima not because it is too big to fail, but because it is too important to fail. With your support, Pima will succeed. This entry was posted in Uncategorized and tagged accreditation, Adult Education, economic development, Pima Community College, veterans on November 4, 2013 by pimachancellor. Helping U.S. military veterans who attend Pima Community College successfully transition to academic life is a priority for PCC. That is what makes a new collaboration between the College and Raytheon Missile Systems, matching student-veterans with volunteer tutors from Raytheon, such an important and promising endeavor. More than a half-dozen Raytheon engineers have volunteered their time to tutor student-veterans in mathematics and science courses this fall. The partnership is headquartered at Downtown Campus, which recently hosted a lunch to connect students and tutors for the fall semester. Downtown Campus President Dr. Luba Chliwniak and Vice President of Student Development Jerry Haynes expect about 20 student-veterans to take advantage of this valuable resource. More than 1,400 student-veterans attend PCC each semester. As a veteran of the U.S. Army, I can assure you that the perspectives and experiences these women and men can share with their fellow students and PCC employees will enrich our campuses immeasurably. This entry was posted in Uncategorized and tagged Downtown Campus, mathematics, military, Pima Community College, science, tutors, veterans on August 23, 2013 by pimachancellor.